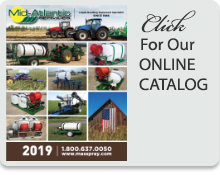 Mid-Atlantic Services specializes in custom liquid handling equipment for use in agriculture, lawn care, golf course and highway maintenance industries. We offer custom solutions and the finest quality spraying and liquid handling products. This includes utility sprayers, tree sprayers, liquid applicators, pumps, tanks and all the parts you need to keep your equipment running smoothly.